Laurie woke up to Paul rustling 2 feet away. Once again she slept so soundly she didn’t hear her alarm. We were up and moving by 6:45am. It was a cold morning. Our fingers ached as they gripped our trekking poles. Within 30 minutes we caught up with Paul and the three of us continued up the gradual trail. Branches and twigs snapped nearby, Laurie looked hopefully in the direction of the noise eagerly looking for a bear. But alas, usually they were just chipmunks. Pine cones dropped from trees near us as well. We weren’t sure if they were falling on their own or if some critter was up in the tree. Either way it felt like someone (or something) was aiming at us. We hiked the 6.5 miles to Rainy Pass through a dense forest. 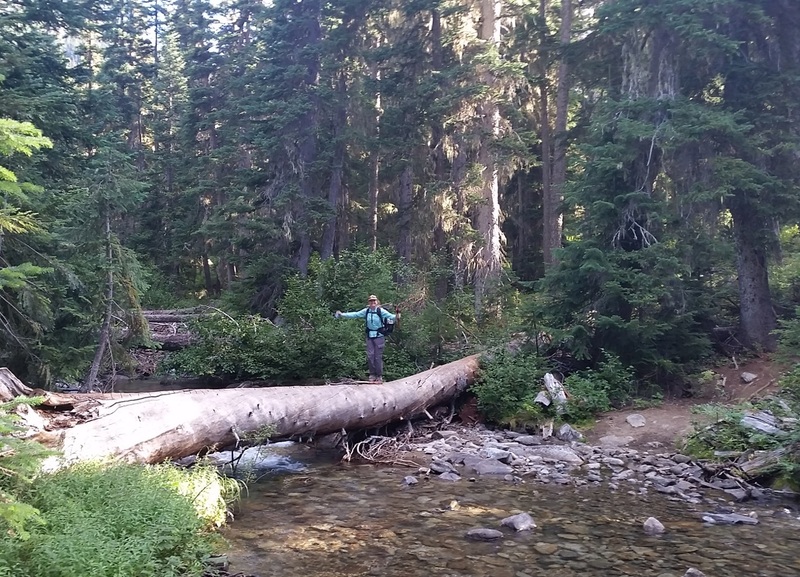 We crossed over beautiful clear creeks on logs and enjoyed conversations to help the miles fly by. The trail opened up a few miles after Rainy Pass. We switchbacked up, periodically stopping to soak up the views to the south and west. Jagged peaks filled in the space between green carpeted mountains in the foreground. In the far distance were snow capped mountains. It was stunning. 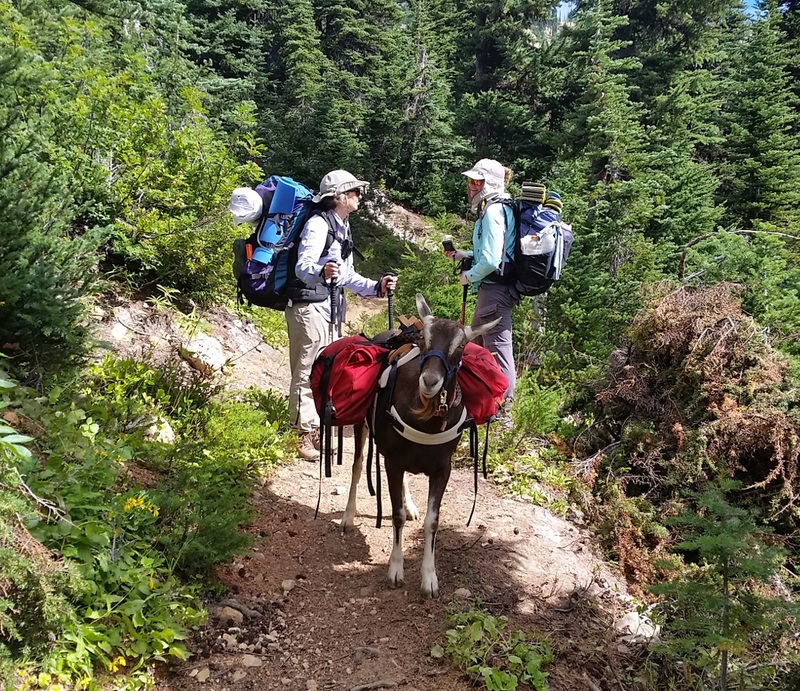 We passed 2 women hiking with their dog and 2 goats and not even a mile later ran into 4 people and their 6 llamas. 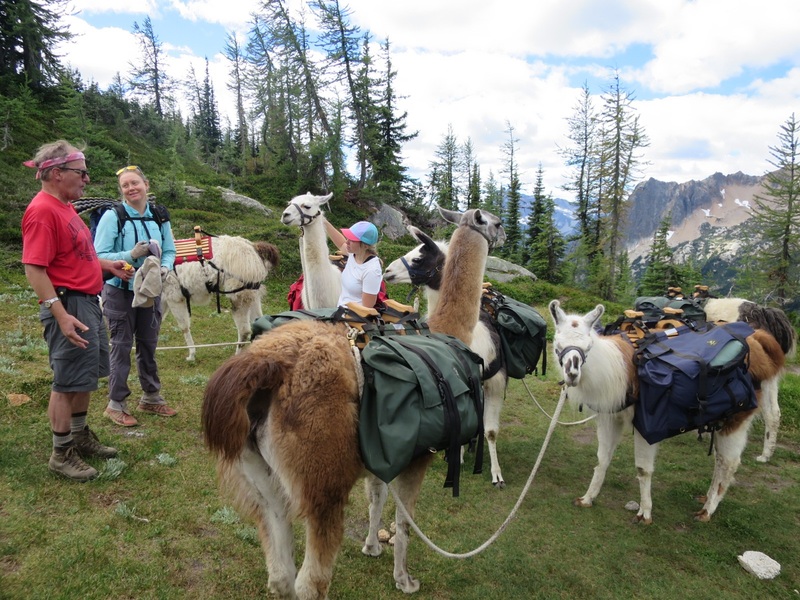 They were taking the llamas in to help pack out a trail crew. We talked to the owner and crew as Laurie pet the llamas. They were all female lamas with names like Ruby and Sugar. Just like all the other llamas we have met on this trail, they each had a distinct personality which became evident in the 15 minutes we spent talking with the owner. At Cutthroat Pass we took a lunch break. We shared a sticky bun from the Stehekin Bakery to celebrate our anniversary of meeting. Four years ago today we met on the top of Mt Whitney! The views were expansive and the forests in the valleys were quite dense. 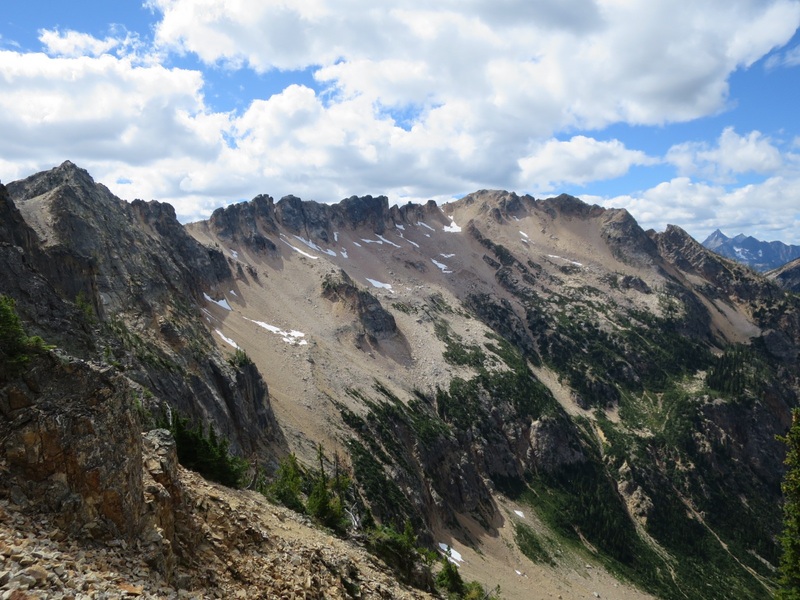 We traversed through rocky trail and eventually dropped down to Granite Pass. From here it was a little more down then steadily uphill to Methow Pass. We passed the trail crew at their camp and thanked them for all of their work. It looked like the trail had been washed away by rock or mudslides in some areas but thanks to all of their hard work it was now a wide and easy trail to follow. 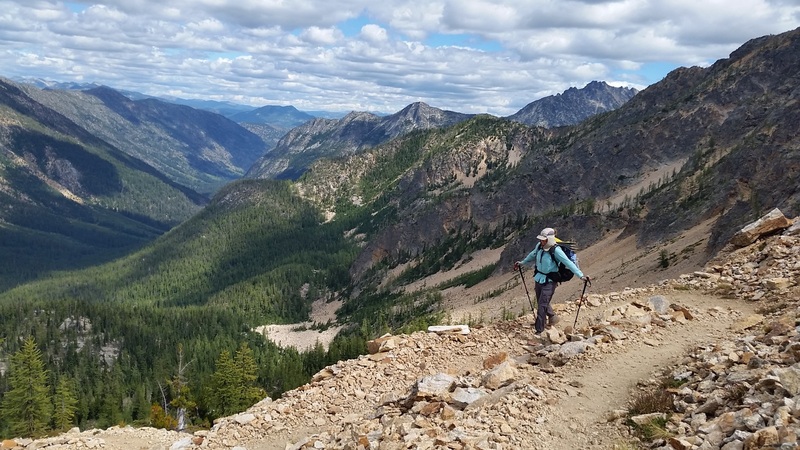 We got to the top of Methow Pass at 3:30 and scoped out places to camp, but nothing looked good enough to warrant stopping that early. We love camping up high with views and although this was a pass, the views were mostly blocked by trees. 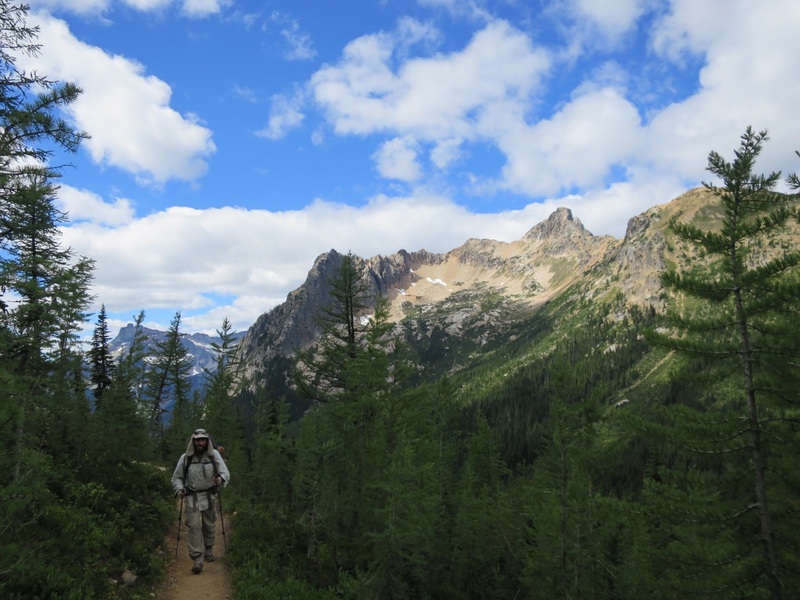 We dropped back down into the forest and eventually to the Methow River. We spoke with Paul about family and kids. Laurie asked Paul if he felt like he put his life on hold to have kids. Having children is something we have talked about a lot. Living in San Francisco we have friends that chose not to have children and their lives and travels appeal very much to us. We also have a lot of friends who have started families in the last few years and their lives are also amazing, but very different. Sure, being a parent may be the best adventure of a lifetime but at this exact moment neither of us are sure what we want. The question remains, will we ever know? Paul joined us for a snack break before we set up camp and he continued on another 3+ miles. We shared cheese with Paul (for Laurie that is a gesture of true affection) and some fruit leather before hugging goodbye. As Paul left Laurie again felt a sense of loss. Here we were, thru hikers stopping and camping before 6 o’clock in a not so scenic area with the hopes of catching up on our blog. We can afford to stop early, after all we did give ourselves 4.5 days to hike 90 miles. 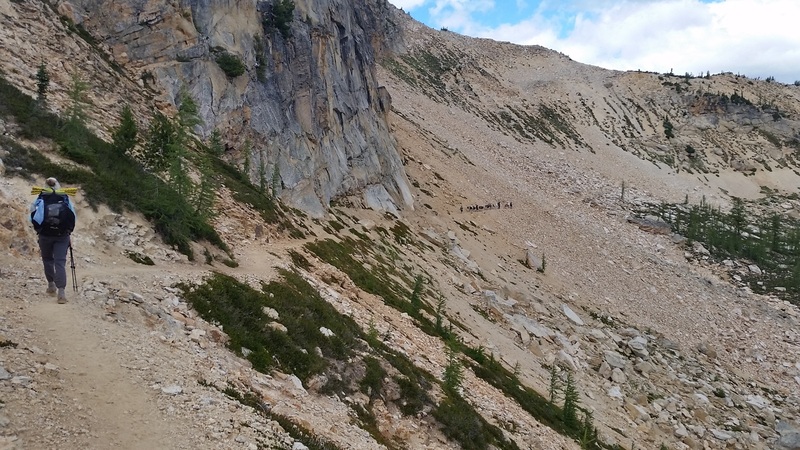 We could do it faster but don’t want to rush through beautiful sections; plus we need to pace ourselves since our hike isn’t over when we get to the monument. All that being said, Laurie gets competitive and doesn’t want to be left behind. 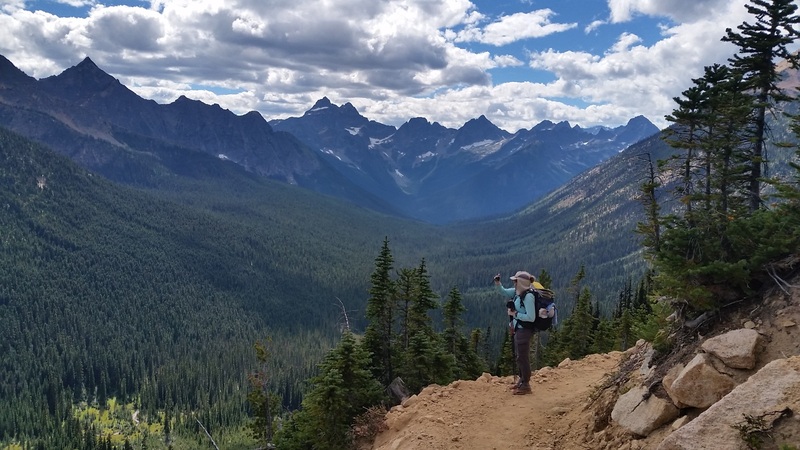 If we had ended early at a beautiful spot, that would have been fine, but here, camped next to the Methow River, she felt lazy and foolish. 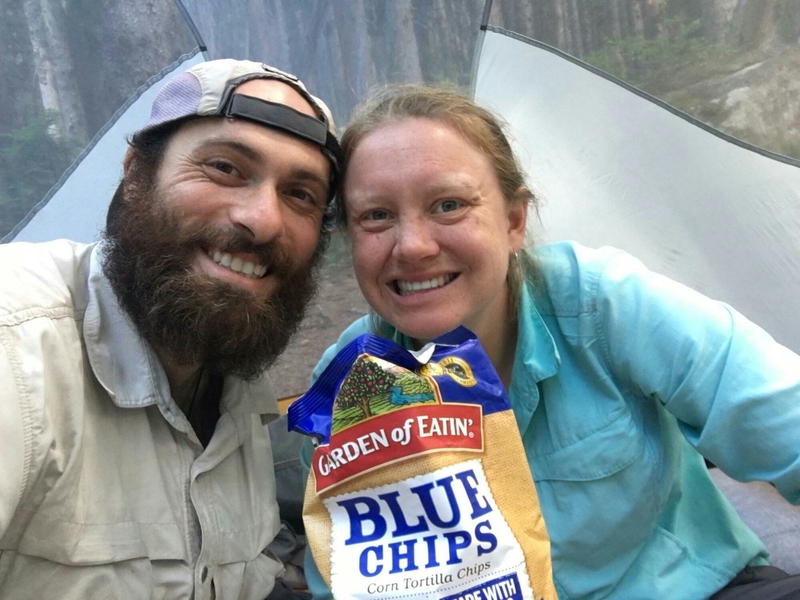 With some time, some tickeling and a bag of blue corn chips (thanks Tommy and Ali!!) the smile returned to Laurie’s face. 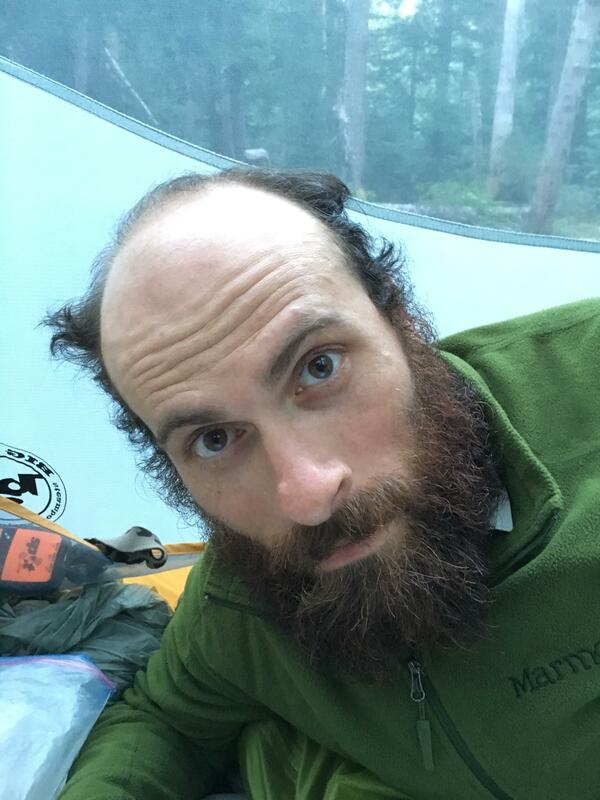 We ate dinner, chatted with other hikers as they walked by our tent and caught up on blogging. We always have big agendas for these “early evenings” but somehow or another it is always 9 pm before we start writing. Oh well, it’ll get done. 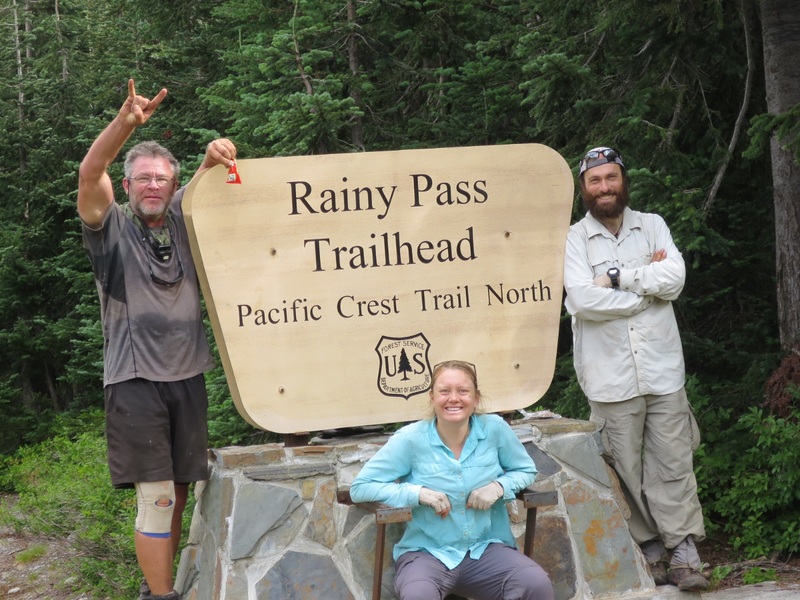 Tonight we are grateful for no rain at Rainy Pass and feet that keep marching. Thank you Tommy and Ali for the treats! I love all you can eat! Haha! Best after long bike rides and hikes!